GretchCannon: Ripped Cream Protein Coffee Creamer Giveaway! 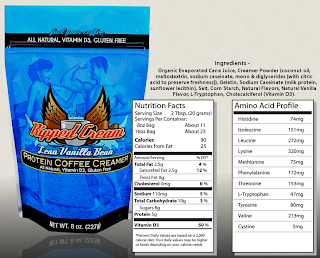 Yesterday I posted a review on the delicious product - Ripped Cream Protein Coffee Creamer! Check out my review HERE. The folks at Ripped Cream have graciously offered to send 1 of my readers a FREE full sized bag of the flavor of their choice - chocolate or vanilla! Enter to win below - you have 1 week from today 8/1! I want to win vanilla. Id love to try the vanilla! Thanks for entering the contest and visiting my page - good luck! :) Your blog name sounds interesting - I will check it out! Ok, thanks for entering the contest!! Good luck! Yeah, and I just bought a raspberry flavored protein powder just because... chocolate/vanilla shakes get real old fast. With the coffee, it opens up a whole new list of options. Mild, Dark, Hazelnut, Colombian roast and a variety of bands... flavors. And at 4:30am in the morning, the last thing I want to do is eat and drink a bunch of liquids (water, coffee, shake) before a workout. My stomach is usually uneasy at that early in the morning. And thanks, I also entered the giveaway! I agree, great, thanks for entering! How is raspberry protein powder? Sounds different! I got the [PlantFusion] Brand. I like it so far. The Raspberry Chocolate only has a hint of raspberry so its not too overpowering. I was just wanting something different from the regular same-old-same-old. Yum sounds good! I hope you have a fabulous weekend! I'd love to try the vanilla flavor!!!! Diane. S: "Yuuuuuuuuuuuummmmm Chocolate looks good." It is so good - ok thanks Diane! I'd love to try the chocolate flavor! Ok Thanks for entering Madeline! Love your name, thanks for entering! I think both would be fabulous. I had weight loss surgery so one of my cross addictions is COFFEE! (decaf) So I think this would help me so much, and make my coffee taste YUMMY! OK Krista! My mom had a surgery like that too - gave up the diet coke but not the coffee! :) Thanks for entering! Vanilla would be great! Thanks! Ray - you are the winner! I will contact you via email about the prize! CONGRATS! I hope you enjoy your vanilla! Vanilla would be divine for lattes too! Both vanilla and chocolate are delicious...would love to win an extra bag! I can't promise both, but if you win I will see if they can give you a sample of one a big bag of one! Good luck and thanks for entering! I really want to try the chocolate! chocolate sounds great. I've never used a protein creamer before! I'd like to try the chocolate one! TY! Thanks for entering! Please check back for more contests soon! I've never heard of the ripped cream protein before but I think the concept sounds super interesting. Would love to try the chocolate! I would love to try the vanilla! Hey everyone! I had 260 entries into the giveaway - thank you so much for the love. I am selecting a winner at random. And the winner is...Ray S! I will contact you asap to get your details. Check my blog for more fun giveaways soon! Cute Ankle Booties for Fall! MIMM #8: Protein Pancake Food Prep! Quest Bar Review & Giveaway! WIAW #4 - Good Eats This Week! Nordstrom Sale Nike Free Running Shoes Find! H&M shopping now online for the US!